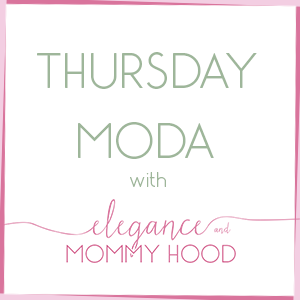 Elegance and Mommyhood. 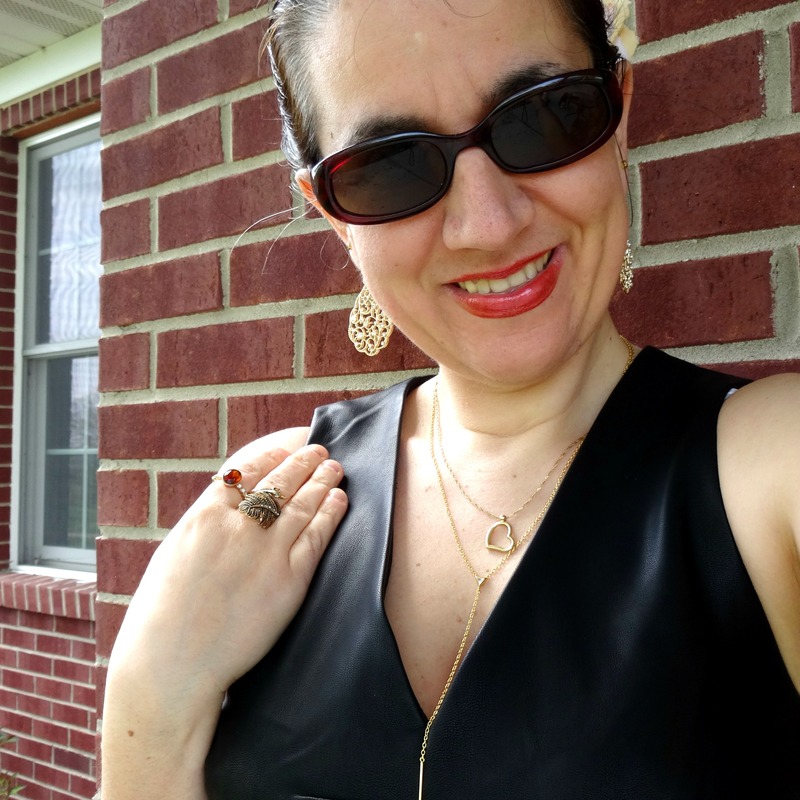 : Thursday Moda #12 and a Little Black Dress (or two). Such a super chic dress on you, thanks for hosting Ada & enjoy your weekend! STUNNING ADA!! Love this dress and the lavender shoes are the perfect touch!! Those lilac colored shoes are so pretty against this b/w leather topped dress! And, I love the softness the flower adds to the outfit that you put in your hair. Love that dress! It's so chic and the lilac heels are the perfect pop of color! You are so sweet to feature me! Thank you so much! Thank you so much for your sweet words. I noticed the background similarity, too! How funny! Love the look of your LBD especially with those lovely heels! Have a great day! Happy to twin with you in black - just can't go wrong with it! Love this dress on you Ada! It almost looks like a top and skirt which is so cool. Thanks for the link up! Great dress! Great choice of shoes, too! 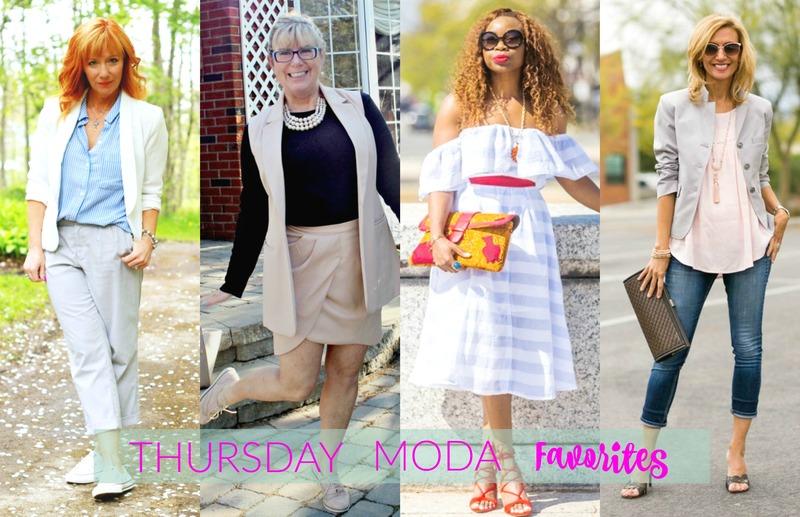 Thanks for the link up & Happy Thursday! Oooh Ada...I love the lilac shoes with this dress you're wearing...it's so much more fun than the expected!! I love the pop of color you have with the heels. Hello Spring! Thanks for hosting the linkup, and have a great weekend Ada! Absolutely gorgeous , and i love your shoes. Such a pretty LBD, and I love how it's made to look like two pieces. Also loving the lilac shoes! Little black dresses are the best! You two look great! Seriously loving this dress, Ada! So edgy and chic. 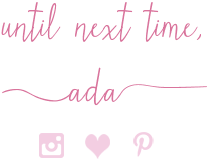 Happy Thursday Ada! You look so chic here. Have a great day! I finally made it to your link-up and thank you for having me. Ada, I love this little dress. How perfect is it for any occasion really?!? Dinner date, semi-formal event, church, graduations, funerals,work place. Seriously a good find and you wear it well. Happy Thursday. Great LBD, love the textures! Great skirt and shoes! Thanks for hosting! That is a lovely dress. I love the contrast between the top and the bottom. our shoes are fabulous, too, and the flower in your hair is perfect! What a gorgeous dress Ada, I love how it can go from work to a more dressy occasion! I did think it was two pieces at first, I love that it's a dress though! I love it when women were coloured shoes with their LBDs. And really like the style of it that it does look like a blouse and skirt! Such a cute outfit. Love the shoes too! 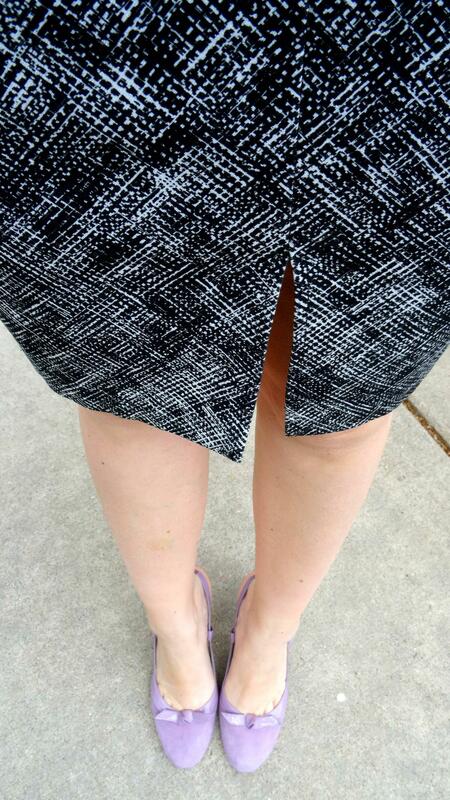 I love how you styled your LBD with the lavender shoes! Its fun to get another look from a dress by pairing it with a skirt! 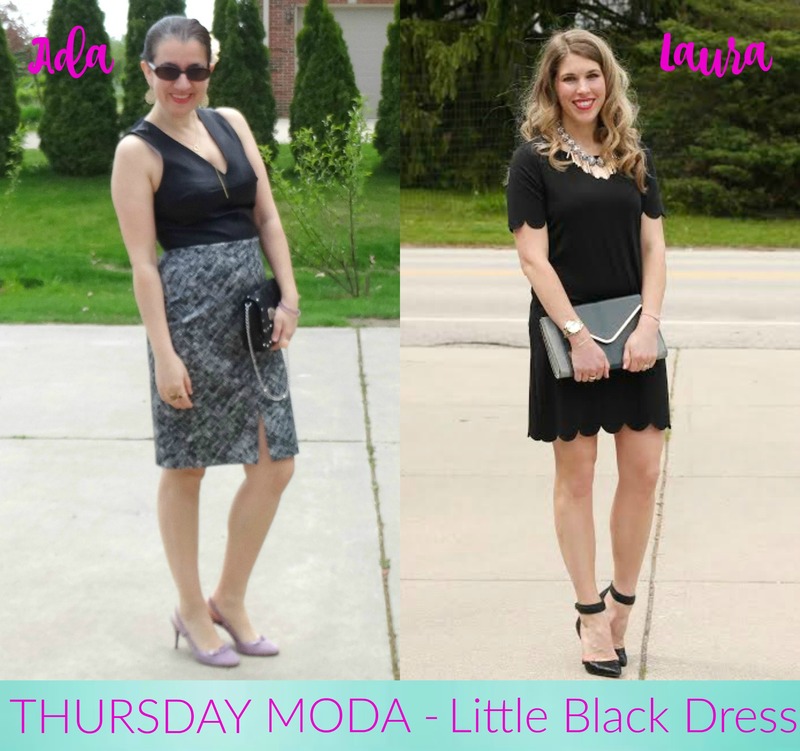 I also love Laura's style and you both look fab in your LBD's today! 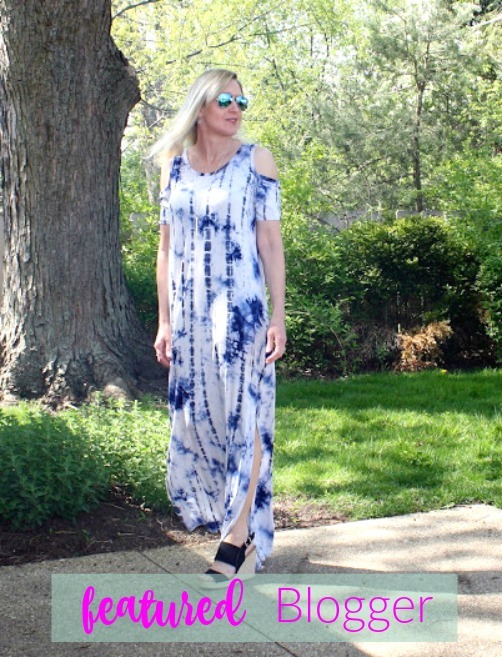 This dress is absolutely stunning on you!! Love how it almost looks like two peices and those heels are gorgeous! Love the dress and the pop of color in your fun shoes, you look fab! Such a great dress, and I love your shoes! Hope you're having a great week! Love how this has the look of two pieces, but the ease of a dress. Also really admiring your layered gold necklaces. Beautiful XOXO! Thank you for hosting. Love how you paired your lilac pumps with your great look! Thank you for hosting Ada! 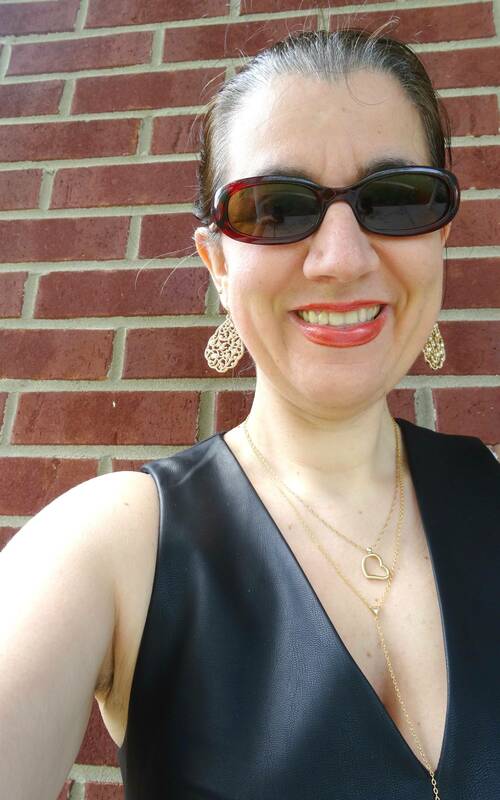 Love your little black dress! The pop of lilac in your shoes makes it a perfect look for spring. I actually need to add a little black dress to my wardrobe at some point. Thanks for hosting! Lovely, adorable and pretty outfit :) I enjoyed your post very much, keep sharing dear! Ada, very lovely in your black dress. You can tell you are happy and enjoying what you are wearing byyour lovely smile. My eyes went directly to your lilac heels, such a pretty pastel color for the spring. Have a great weekend! No it's OK. I just wanted to make sure you saw it and YOU ARE VERY WELCOME!! Very well deserved! Lovely outfit you out together and I love your heels! What a fun top and cute shoes, too! Looking gorgeous Ada. I have a similar dress from the Limited that I wonder if I can still fit in. Such a great look - love how those lilac pumps stand out! You ladies look chic and stunning!